Kitchen faucets come in a variety of shapes and sizes. With some of the best designs available coming from the pull-out category. While pull-down faucets have some great designs, the true stunners are in the pull-out category, making them attractive to buyers designing modern kitchens, such as those that like oil-rubbed bronze kitchen faucets. Below is a good sample size of the best pull-out kitchen faucets available for your money. The best pull-out kitchen faucets may be difficult pin down when you’re searching for the perfect option for your home. The top faucet brands all have pull-out designs to choose from—and they come in many styles, colors, and finishes to choose from. Pull-out kitchen faucets are commonly found in kitchens—and their greatest rival is the pull-down faucet. Both are excellent faucet types to choose from, but the pull-out faucet is easier to pull towards you and move around to peripheral areas of the sink. The pull-put kitchen faucets featured here are among the best out there. If you’re set on one of these, you’ll find the ones on or list offer amazing functionality, are highly effective, and will help you pull together your dream kitchen. So, whether you’re remodeling your kitchen or simply replacing your current faucet, each of the selections here are a great way to go. This is a nice lightweight kitchen faucet in an unforgettable vintage styling that is capable of 1.8 GPM of water flow with a spout height of 10.69 inches and spout reach of 10.06 inches. With Watersense certification and Delta’s proprietary Diamond Seal system, this is easily one of the best pull-out faucets on the list. It can be installed in 1- or 3-hole setups since the high arc spout gives so much clearance for sink access. This mid-priced Kohler kitchen faucet is a designer’s dream, coming in a multitude of colors. An easy installation and lifetime limited warranty rounds out the great features of this product. For buyers needing more space around the sink, the swivel is a full 360 degrees for clearance purposes when you need it out of the way quickly. Available in a range of colors, this high-priced Delta model has a fun take on the pull-out kitchen faucet. Available colors include arctic stainless, champagne bronze, chrome, and Venetian bronze. They all have their unique qualities and look brilliant in any kitchen setting. The system comes as a 1- or 3-hole, 8-inch installation with a swiveling spout that goes about 120 degrees each way. This is a nice lightweight kitchen faucet in an unforgettable vintage styling that is capable of 1.8 GPM of water flow with a spout height of 10.69 inches and spout reach of 10.06 inches. Both the finish and the faucet have a lifetime limited warranty, so consumers can breathe easy in knowing that their purchase is protected for years. When docking the spray head, the security of the dock mechanism is notable and you won’t have the same issue as older kitchen faucets with the spray head drooping after too much use. It would have been nice if they included the escutcheon plate in this package, but even without one, this is one of the best items on the list if you’re looking for a pull-out kitchen faucet. Delta makes another appearance with this low-priced Linden model in chrome, Venetian bronze, Oil-rubbed bronze, and arctic stainless. This is one of the more detailed designs you’ll find on a kitchen faucet this low in price. Water efficiency peaks with this model and it even has an optional flow feature to fill vases, pots, or the sink. The consumer has full control over how the faucet operates with a multi flow option that uses 1.5 GPM for the spray settings and 2 GPM for stream, giving you full control over how to use your water. As if this wasn’t good enough value already, Delta also included an optional 10 ½-inch escutcheon for the installation. The spout is 10 inches long and 8 inches high to give you great coverage when it’s in use and not in use. With Watersense certification and Delta’s proprietary Diamond Seal system, this is easily one of the best pull-out faucets on the list and is made from the ground up as a premier item. If you want the best of the best, then this product should be your first move. From the Pfirst series comes this ultra low-cost pull-out faucet that has become quite popular over the last few months. It is available in stainless steel, polished chrome, Tuscan bronze, and white. All of the colors look great up close and far away, a pleasant surprise for a faucet of this cost. Pfister is serious about kitchen faucets and their products and this system meets ADA/ANSI A117.1 requirements while complying with NSF/ANSI 372 for lead-free plumbing. It can be installed in 1- or 3-hole setups since the high arc spout gives so much clearance for sink access. When using the pull-out spray head, the spray and stream mode buttons are easy to reach and don’t get in the way. Flow rate is a standard 1.8 GPM despite water consumption being 2.2 GPM, which will balance out with use. The brand’s limited lifetime warranty is good and has been proven by satisfied customers to work just as well as those from bigger manufacturers. It’s not often that an unknown brand makes a splash on a list like this, so Pfister should definitely be taken seriously by all consumers. This mid-priced Kohler kitchen faucet is a designer’s dream, coming in a multitude of colors for buyers to enjoy. Colors available include vibrant stainless, vibrant brushed nickel, vibrant brushed bronze, polished chrome, and brushed chrome. Built into this system is one of the most powerful ceramic disc valves on the market that exceeds industry standards for durability over twice as much as the average valve. The overall color is resistant to corrosion and tarnishing, so whatever great color you pick, you can expect it to last over the lifetime of the system. Mineral buildup is also resisted due to the MasterClean sprayface, an easy-to-clean solution on the spray head. If there are kids in the home, then the high temperature limit is the perfect way to protect them by setting a preset limit to how hot the water can get. An easy installation and lifetime limited warranty rounds out the great features of this product. There are a lot of great pull-out kitchen faucets available but this one is probably the prettiest one available on the list. This particular Moen kitchen faucet is at the mid-price point and comes in spot resist stainless, oil-rubbed bronze, matte black, and chrome. Both fingerprints and water spots are resisted on the pull-out spout thanks to Moen’s modern technology. The 3-function spray head offers some of the best features you can get from a pull-out faucet with functions for pause, rinse, and aerated stream. Installation is both quick and painless thanks to the proprietary Duralock Quick Connect system by Moen. It that makes putting everything together a tool-free and hassle-free solution. Enjoy some of the best reach ever with a 68-inch braided hose, one of the longest you can get in the industry from a brand name maker. For buyers needing more space around the sink, the swivel is a full 360 degrees for clearance purposes when you need it out of the way quickly. As an added bonus, an optional escutcheon is bundled in with the faucet, so setting it up however you like is even easier. This is a wonderful buy for the asking price and one of the best you can buy from this list. This futuristic kitchen faucet from Moen is a high-priced option that offers an alternative look for those that want something a little different. Available colors include classic stainless, silver/pewter, and chrome. They are all high quality and the epitome of luxury when compared to other faucets in higher price ranges. The shape of the pull-out kitchen faucet provides a great arch so there is a lot of space between it and the one lever handle you will use to control the water. Like most Moen products, it has a tool-free installation using the Duralock Quick Connect system and continues to function perfectly after years of use. This is an ADA-compliant product that features some of the most user friendly features available for the current price. Included is an extra-long braided 59-inch hose that will go with you anywhere in the kitchen and is ultra-flexible. The flow rate is capped at 1.5 GPM to allow for greater control when using at different angles. Built on the 1255 Duralast cartridge, using the handle is smoother than anything you will experience with a water faucet. For buyers wanting a futuristic take on kitchen faucets, this will more than satisfy your need. Next up is a ultra-low priced Premier 120161LF Sonoma Lead-Free Pull-Out Kitchen Faucet, which comes in at about the second lowest-priced pull-out kitchen faucet on the list. Brushed nickel and chrome are the only available colors, but both are very well constructed. The system uses a tried and true ceramic disc that holds up to years of abuse, while backing it up with metal lever handles that were made for heavy use. Using a detachable deck plate during the installation will allow users to decide on the best setup for the product, especially if they have extra features they want on their deck. The flow rate is extremely high at 2.2 GPM, so this little thing is a powerhouse with a spray head that is meant to power through dishes. The premier limited lifetime warranty is well regarded by many in the community and holds up well over the years when compared to the bigger brands. 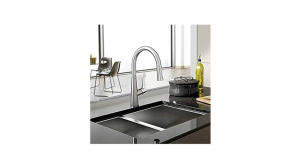 Compared to the last model, the contemporary design of this kitchen faucet is very laid back and made to blend in with kitchens rather than stand out. For the last product on the list, this is a great buy if you want something that performs well. As one of the industry leaders, Kraus starts off the list with this high-priced single lever pull-out kitchen faucet featuring a lead-free brass construction. This has one of the best levers on the list and gives you full control over the water temperature and power, all within a single lever system. A swiveling spout grants a lot of room when needed, especially in situations where you have a big pot or bucket in the sink. The built-in counterweight will keep the spray head from drooping, and the spray head itself is a dual function masterpiece that will wow you with its efficiency. The flow rate is 1.8 GPM with a faucet hole size requirement of 1.375 inches and maximum deck thickness of 2.5 inches. The Ketox ceramic cartridge is tested through 500,000 cycles, so expect it to last well for the lifetime of the product. The spout height is a good 7.5 inches with a reach of 9 inches total. This product is certified by several major agencies including the FTC, ADA, UPC and others. This isn’t bad at all for the first on the list, and will prove useful for those that decide to buy it. Hitting the midway point in the list, Danze introduces the Melrose, a low-priced kitchen faucet that comes in two colors — stainless steel and chrome — and, although not the most stand-out item on the list, it is nicely designed. Using the spray head is fun and even with just two functions of spray and aerated stream, it does an entirely thorough job with whatever you put in front of it. Included with the system is a brass soap dispenser that ticks all the boxes for both design and overall quality, and since the included deck plate is optional, consumers have a range of installation options to choose from. Danze’s warranties are well known in the industry and the limited lifetime warranty on this product is no exception, offering great coverage from top to bottom. The swivel action gives ample coverage when you need to access the sink, and consumers will be glad to know that the spray function of the head uses a lot less water than other options. This is a quiet contender on the list that will look good in a lot of kitchens. Regardless of whether you are set on a pull-out faucet or simply considering it, potential buyers will be happy to hear that pull-out faucets also come in several design and style options to pick from. So, if you have a specific look you are wishing to achieve in your kitchen you will be sure to find something that will help bring it all together. Inspired elements. On the other hand, you can also pick a single-handle design (which is popular with pull-out kitchen faucets) so you have a more minimalistic and modern look in your kitchen. The single lever faucets control the water pressure and temperature with just a single lever and is connected to a single supply line. This means it takes a little longer for the water to heat up in comparison to the double handle faucets—although it the difference is not that significant. Pull-out kitchen faucets come in just as many color and finish options to choose from as all other faucet types. This can make choosing your next faucet a bit more exciting since you will be able to sift through color and finish selection that will match your kitchen perfectly and pull all your design elements together. Some brands may offer more color and finishes for a more of their faucets—Delta, Moen, and Waterstone specifically are some of those that will have more combinations to choose from. Kohler, on the other hand has a less array of finish and color combinations, although they still have a large variety—and these typically come at a lower cost. Waterstone offers a unique opportunity that other brands don’t have. They have a “build your own” where you can put in all of your requirements and they will refine there search strictly to your needs—and they will even let you select different colors and finishes to combine on the faucet of your choice. This of course means the brand is pricier than others, but if it fits your budget, you’ll find this process well save you a lot of time and help you literally find the perfect faucet for your kitchen. Overall, when looking at color and finish alternatives just make sure you are looking for something that will look great in your space and has the features you are looking for in your dream pull-out kitchen faucet. If you have decided that you want a pull-out kitchen faucet for your home the next thing you need to look at is the type of mounting base you are working with. Most faucets are one or three-hole mounted faucets–of course, there are also wall-mounted options, but this does not typically apply to pull-out faucets. So, if you want your faucet to flush with the surface then the single-hole faucet is right for you. The three-hole mounting option, on the other hand, will not look as flushed as the single hole faucet. This one, like the name suggests, has three holes that you will need to line up in order to properly mount the faucet. Both the one-hole and three-hole faucets may come with an additional sprayer—however if you are purchasing a pull-out faucet you won’t need to worry about this since the faucet itself functions as sprayer. If you are looking to replace your current faucet, you’ll find that it is a relatively simple process. First and foremost, make sure you purchase a faucet that is compatible with your mounting options—whether it be a one or three-hole mounting options. Once you’ve gotten your faucet ready to be installed, you will need to turn the water source off and disconnect the supply lines. If you’d like you can stick a bucket or bowl under the sink to catch any water that may drain out of the supply lines. Now you can remove the old faucet and clean the area thoroughly before beginning to install the new faucet. Make sure to line up the hole mounts and secure the faucet. To the base—if you have a 2-handle faucet without a deck place you will have to attach each part of the faucet separately. When this is completed, you can connect the supply lines and make sure they are secure. Then turn the water source back on and run the faucet to make sure there are no leaks and that you didn’t miss anything. It’s important to note here that you should always refer to your faucet’s manual before installing. Some faucets may be a bit different and others may have additional features that need to be setup—touchless faucets, for example may require more careful calibration, batteries, etc. the features they are looking for in their faucet, pinpoint the design the like best, and figure out what color and finish will work best in their kitchen. We also recommend everyone take into account the sink they are working with—or if you are planning on purchasing a new sink, make sure the faucet you choose is compatible with that one as well. Pairing the perfect faucet with the wrong sink can be disastrous. Overall, pull-out kitchen faucets are some of the most popular faucets available. If you are dead set on one of these then the featured selections on this list are a great way to go! If you still aren’t sure, take a look at some other kitchen faucet types and see if the will work better than the amazing features selections featured here. Hopefully, this list showed you some wonderful pull-out kitchen faucets to fit the bill for your project. With prices ranging from low to high, there’s plenty of choice, but only a few may be perfect for what you need. With pull-out kitchen faucet installation now as easy as ever, putting one in place is as simple as opening the box and counting down a timer. If you are still not decided you can read more kitchen faucet reviews or visit our faucet guides here. Welcome to my blog, its a resource for those looking for a new kitchen faucet, feel free to brows my site. How to Choose the Perfect Kitchen Faucet for Your Kitchen?